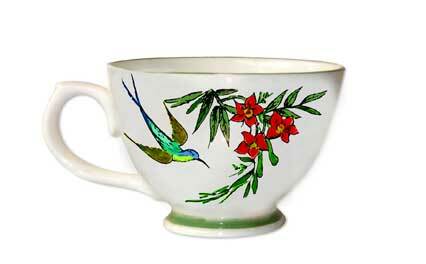 Provided are vintage designs for a tea and dessert set with colorful hummingbirds and flowers. Hand-painting china was a popular pastime for ladies during the Victorian era, as well as, entertaining friends and acquaintances with an afternoon tea. A well-liked project was decorating white china tea and dessert sets with floral motifs to use during the tea. We have provided original 19th century designs and instructions to embellish a teacup, saucer, and dessert plate with a colorful floral pattern and a hummingbird. With these designs, you can create your own china dessert sets for entertaining in an elegant bygone manner. For a unique and charming gift with a personal touch, you can create a single teacup and saucer set to be placed in a basket with tea, sweets and flowers. Find out how to make a tea set. Victorian etiquette would never approve of Instagram. See why. Delightful book combines the magic of Alice in Wonderland with the timeless charm of tea. Discover how to have a high tea ... table settings, menus and desserts. How did people amuse themselves during a cold winter a hundred years ago? How do you decorate with antique and vintage dishes?